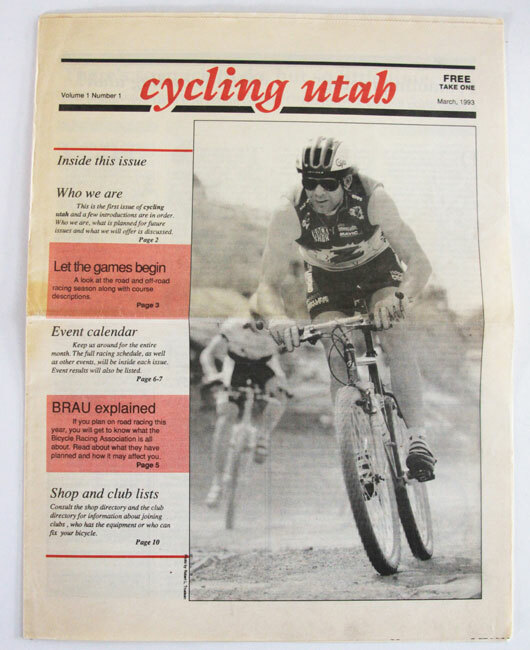 Cycling Utah's inaugural issue came out in March 1993. Bob Roll, shown here competing in the 1992 Moab Rocks! Mountain Bike Race, was featured on the cover. With this issue of cycling utah, we commence our twenty-first year of publication. It was in March, 1993 that the inaugural issue of cycling utah hit the stands. Or to be more accurate, the cycling and sporting goods shops. That was exactly 20 years ago. You can read the first issue online at the University of Utah. Just search for Cycling Utah. Twenty years. That is one-third of my entire life. One-half of my adult life. For twenty years I have been writing articles for cycling utah, delivering cycling utah along the Wasatch Front, packaging cycling utah to be shipped throughout the intermountain west, and handling cycling utah’s adminstrative affairs. So we both threw in $700 to pay the costs of our first couple of issues, and wondered if there would be any more after that. We agreed that Bob would handle the editorial responsibilities, I would take on the administrative duties, and we would both write articles and sell advertising. We each approached those we knew, and some we didn’t, who owned bike shops or promoted events, and were pleased with their reaction and support. Thanks to them, cycling utah made it through its first year, and Bob and I were able to pay ourselves back the $700 we had paid in to begin this experiment. For the next few years, it was an annual decision, not an issue to issue decision as before, whether we would continue. After the final issue in the fall, we would breath a sigh of relief and put off till the following February deciding whether cycling utah would continue another year. Thankfully, cycling utah maintained its own financially, though Bob and I were certainly not quitting our day jobs. That made the decision to continue easier. About year four, we hired Dave Iltis to sell advertising. He was in school, was a bike rider, raced, and this was an opportunity for him to earn some part-time income. That was a good decision. Dave had a knack for selling ads, and we were immediately growing in size and in gross, if not net, income. Still, cycling utah kept holding its own. After a few more years in 2001, Bob decided it was time to quit working two jobs while receiving one income. Dave Iltis expressed a desire to take over Bob’s responsibilities and Bob and I agreed. That, too, was a good decision. While neither Bob nor I were in a position, or even desired, to make cycling utah a career, Dave was able, and had the enthusiasm, to put more effort into it. Thanks to Dave’s efforts, cycling utah continued to grow. In fact, it grew to the point that he could, and did, put all his effort, heart and soul into making cycling utah his career and eventually became a partner in cycling utah. What cycling utah is today is the result of his efforts. As a result of his efforts, there is likely no one in the intermountain region we serve who knows more people in the cycling community, knows more of what is happening in all aspects of cycling, and understands all facets of cycling better than Dave Iltis. For my part, I was able to incorporate cycling utah into my life in way that benefited cycling utah while allowing me to stay involved. Having a private law practice, I was able to use the resources of my office to handle many of my administrative responsibilities. I could also share my secretary to meet many of cycling utah’s needs. I also had a wife and children who could be counted on to assist with the preparation of cycling utah for delivery and shipping each month, and with the delivery itself. For twenty years, my wife, children and I have been, and still are, driving the Wasatch Front delivering cycling utah to bike shops, coffee shops, retail sporting goods stores, gyms and many other locations to be picked up by interested readers. Most importantly, cycling utah has had excellent support from the cycling community. Bike stores, event promoters and, as cycling utah has grown, other businesses and persons have supported us with their advertising dollars. In the end, they are the lubrication that makes this publication successful. It is in thanks to these people and these resources that cycling utah is still around. Frankly, a lot of stars have lined up to make cycling utah a successful and thriving publication. Finally, it has been very personally satisfying to me. cycling utah was my personal brain child. I am more widely known for being the founder and publisher of cycling utah than for any thing else I have done. But beyond this notoriety, I am mostly proud of the fact that, not only is cycling utah still around, but it is thriving. It is one of the very few successful regional cycling publications in the country. Above all, it serves the local and regional cycling community well, and is helping it to grow. Here’s to the last twenty years, and to the next twenty years to come. Join us for the ride.